Sign up for Broadjam today to follow Burnin' Ben, and be notified when they upload new stuff or update their news! 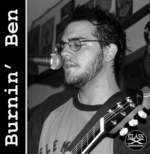 Acoustic Groove Rock has a great connection with Burnin' Ben, capturing the souldfullness of this acoustic musician. With special guests on his debut cd, you can hear the passion put into this CD.